I know what you’re thinking. Dave Hebler? Isn’t he the guy who wrote that book Elvis What Happened? with Red and Sonny West? The book that possibly sent Elvis over the edge in the final weeks of his life? Yes this is the same Dave Hebler, and that was 40 years ago. Not that I love they wrote that book, but everyone seems to have forgiven Red and Sonny, so why not Dave who didn’t know Elvis as long as Red and Sonny. And if you’ve read Elvis What Happened? you’ll see that nothing was untrue in the book, but it just shouldn’t have been released while Elvis was alive and not by his closest friends. But that was then and this is now. And today Dave Hebler seems like a really nice guy, at least from what I can tell by emailing with him and messaging him on Facebook. I was happy and even excited to get Dave’s book The Elvis Experience. Dave sent a numbered, signed copy of his book as well as an autographed photo and himself with Elvis. I enjoyed his book. It was a quick, easy read and told storied I hadn’t heard before. I really didn’t know much about Dave’s relationship with Elvis, except he taught Elvis karate. And there was a lot about karate, but other stories as well. The only thing I did not like were the parts where Dave spent time quoting from Red and Sonny from Elvis What Happened? and from Sonny’s book Still Taking Care of Business. 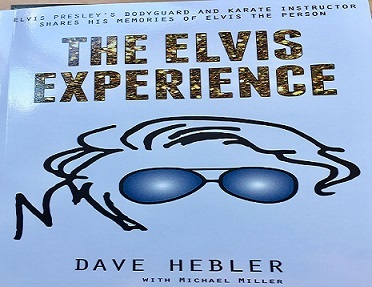 Dave Hebler’s The Elvis Experience is definitely worth a read though if you’re an Elvis fan.